DENVER — Some students at the University of Denver say they feel threatened after several racially-charged messages started to appear on campus. In the last few weeks, the messages have been painted on the “free speech wall” outside the student center. 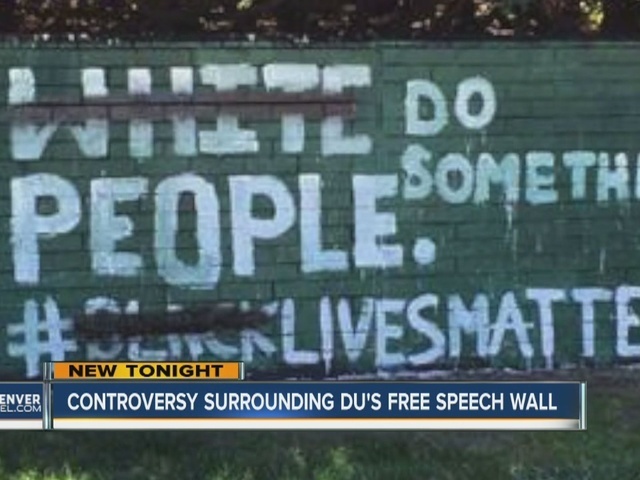 “It’s a pretty peaceful wall in general. Very recently to honor recent deaths the black student alliance wrote 'black lives matter' on it,” said Tashan Montgomery. It could be subjective to some, but Montgomery points to the Minor Threat lyrics painted on the walls. “I definitely feel threatened, because if I go to a school, where we can’t even come together to honor dead people, then that really makes me wonder how much students care about students of color here," he said. In a letter to the DU community Thursday, the university said it hopes those messages can spur a productive conversation about a complex issue. “We understand how some may be threatened by the notion that they inherited privileges from prior generations. And yet, that reflection and admission is exactly what we must do if we seek to build a better future for all,” the DU letter read. Dorey Spotts is a law student at DU and thinks the wall is a great idea. “Free speech is obviously a good thing, and it’s a constitutional right that we all have to say what we think,” said Spotts. As a law student, Spotts points out that freedom of speech protects unpopular speech but not hate speech or threats. “The Constitution really protects us when we say those things, and I haven’t seen anything that is inciting any kind of violence or anything like that. However, I’m white, so I don’t know how people who are obviously very few numbered here are going to feel about that,” said Spotts. The messages were painted over by some members of the faculty.